The scalable New Jersey map on this page shows the state's major roads and highways as well as its counties and cities, including Trenton, the capital city, and Newark, the most populous city. To display the map in full-screen mode, click or touch the full screen button. To zoom in on the New Jersey state road map, click or touch the plus (+) button; to zoom out, click or touch the minus (-) button. To scroll or pan the zoomed-in map, either (1) use the scroll bars or (2) simply swipe or drag the map in any direction. (The scrolling or panning method you use will depend on your device and browser capabilities.) At any time, you can display the entire New Jersey road map in a new window or print this page, including the visible portion of the map. New Jersey's Interstate Highways connect its major cities and facilitate travel between New Jersey and its neighbors. I-76 links I-295 with Philadelphia, Pennsylvania via the Walt Whitman bridge. I-78 and I-80 traverse central and northern New Jersey, respectively, from east to west. One segment of I-95 extends from the New York border southwestward into central New Jersey, while another segment extends a few miles northeastward from the Pennsylvania border near Trenton. Between these segments, I-95 is incomplete; most travelers use the New Jersey Turnpike to travel between northeastern and southwestern New Jersey. New Jersey's auxiliary Interstate Highways serve the state's metropolitan areas and suburbs. I-195 extends from Trenton eastward to the Garden State Parkway near the Jersey shore. The I-278 feeder highway connects Linden with I-95 and the Goethals Bridge into Staten Island, New York. I-280 connects I-80 in Morris County with I-95 in Hudson County. The I-287 beltway arcs around the New York metro area, while I-295 parallels the Delaware River to the east of Philadelphia, joining I-95 north of Trenton and crossing into Delaware via the Delaware Memorial Bridge. I-676 links I-76 with Philadelphia, Pennsylvania via the Ben Franklin bridge. On the border of Pennsylvania and New Jersey lies the forested valley known as the Delaware Water Gap National Recreation Area. Kittatinny Point Visitor Center off of I-80 offers stunning views of Kittatinny Ridge and access to an 18th century wagon trail known as Old Mine Road. The nearby Worthington State Forest is crossed by the Appalachian Trail and is popular with hikers and campers. Millbrook Village is home to 23 restored 18th century buildings, and High Point State Park offers spectacular views all the way to New York City. 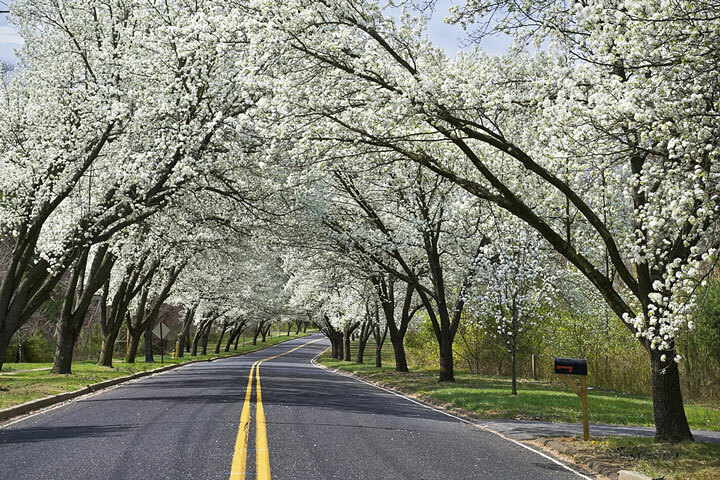 More information about scenic roads in New Jersey is available on these America's Byways: New Jersey and Scenic Byways in New Jersey pages. Other major New Jersey highways include the Atlantic City Expressway and the Garden State Parkway. The Atlantic City Expressway traverses southern New Jersey between Atlantic City and Gloucester County. The Garden State Parkway traverses the length of New Jersey between Cape May County in the south and the New York State border in the north. For more information about New Jersey's roads and transportation infrastructure, visit the New Jersey Department of Transportation website. For New Jersey road traffic conditions, visit the Federal Highway Administration's New Jersey Traffic Information page. New-Jersey-Map.org is a State Maps reference source.